Crankshaft pulley holding tool – No.0132.AA. Turn crankshaft clockwise until crankshaft timing mark aligned with pointer  . Ensure camshaft adjuster timing mark at 12 o’clock position  . Ensure camshaft sprocket timing mark at 12 o’clock position  . Align yellow coloured chain link with crankshaft sprocket timing mark  . 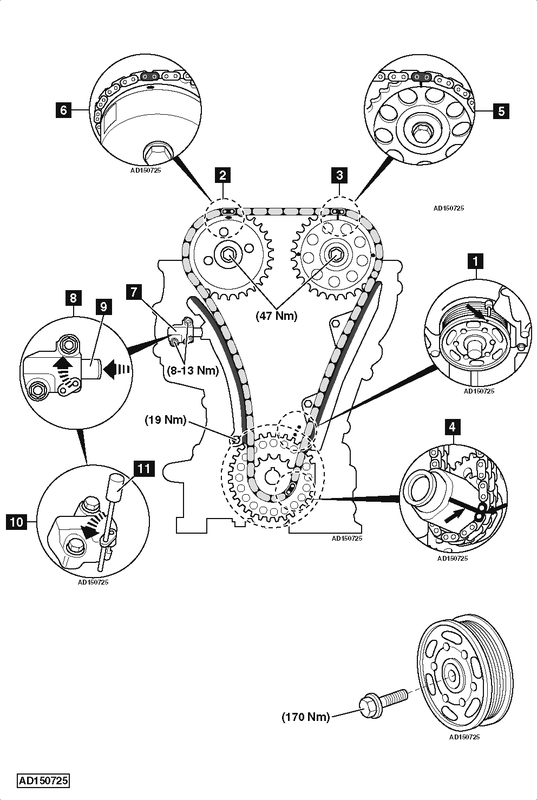 Align orange coloured chain link with timing mark on camshaft sprocket  . Align orange coloured chain link with timing mark on camshaft adjuster  . Reset timing chain tensioner  . Retain in position with suitable pin  . Remove pin to release timing chain tensioner plunger  . Thank you very much, it was very useful, same as Peugeot 107.